Composition dolls overtook the market for bisque dolls in the early 20th Century. Hailed by American dollmaking companies as unbreakable compared to bisque (also often called porcelain) dolls, the novelty of the new material for doll heads, coupled with World War I, helped to bring down the once mighty German dollmaking industry, and helped to make America the premier dollmaking country of the early-to-mid 20th Century. What Is Composition and What Is a Composition Doll? Composition is generally a mixture of glue mixed with sawdust. Heavier and denser than paper mache, composition is easily molded and is thus an excellent material to make doll heads. Composition was used to make doll bodies for many years, from approximately the late 1870s, long before it was widely used to make doll heads. Since the material a doll head is made from determines the type of doll, only dolls with heads made of composition are referred to as composition dolls. Composition dolls were made from approximately 1909 through the early 1950s. The height of the market for composition dolls was the 1920s through the 1940s. Today, only the rare reproduction or art doll is made of composition today. Although you can find nearly any size of composition doll, generally you didn't find very small ones, but tiny composition dolls such as the Wee Patsy or National Costume Dolls of only a few inches in height do exist. Alternatively, very large dolls were generally not made of all-composition because they would be far too heavy for a little girl to play with. Large Mama Dolls, for instance, might have a head and lower limbs of composition but a torso of cloth. A large number of doll companies made composition dolls. They were made in countries including the United States, Germany, France, and Japan. By far, American manufacturers produced the most. Certain companies were especially known for the quality and innovation of these dolls, including Madame Alexander, Effanbee, American Character, Amberg, and others. Many other companies would then copy their designs and sell unmarked dolls, and many dolls that are found today are unmarked. Nearly every type of doll was made of composition, but the most popular styles tended to be Mama Dolls, baby dolls, and, especially after Shirley Temple, little girls and even teenagers. 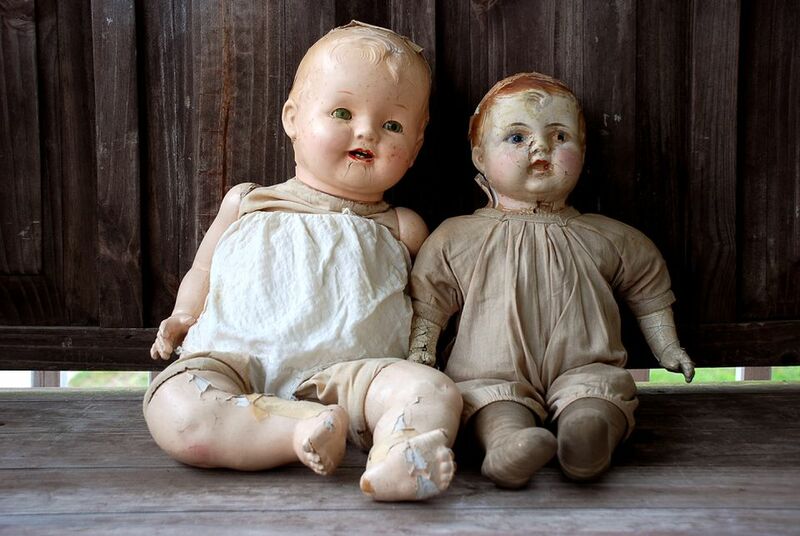 Mama dolls were toddler dolls with a mama crier, they often also walked. The vast majority of dolls had all-composition bodies jointed at the neck, hips, and shoulders, with sleep eyes and wigs, although earlier pre-1930 dolls were more likely to have painted eyes and molded hair. What Caused the Demise of Composition Dolls? In short, hard plastic caused the demise of composition dolls. In the late 1940s companies finally created the first truly unbreakable doll out of hard plastic. If you dropped hard plastic it didn't break, if you put it near fire it didn't ignite (like celluloid) and if you got it wet (like composition) you didn't ruin the finish. Plus, hard plastic dolls were relatively inexpensive. After hard plastic was introduced, composition dolls only lasted a few short years more, into the 1950s. What Is Crazing of Composition Dolls? Composition dolls, especially those with a heavily sealed or lacquered finish, are especially prone to fine cracks, called crazing. The crazing is caused by changes in moisture and temperature. Because so many of these dolls have crazed over the years, light crazing on a composition doll is acceptable to collectors. However, lifting of the composition or cracking of the dolls will decrease their value significantly. Prices for these dolls run the gamut from very inexpensive for unmarked or souvenir dolls to many hundreds of dollars (or more) for the choicest Shirley Temple, Effanbee, and Madame Alexander composition dolls in mint, original condition. If a collector is inclined, a nice collection of vintage composition dolls from unmarked makers or dolls in replaced clothing can be built on a budget. As of 2019, many such dolls are available from dealers or from eBay for under $100. You can find many of these dolls, as well as composition souvenir or National Costume Dolls for much less. On the other end of the spectrum, expect to pay $500 to $1,200 for dolls in mint condition and original Shirley Temples with minimal crazing, and several hundred dollars or more for mint composition Wendy and similar dolls by Madame Alexander. Mint and original dolls by Effanbee (including Patsy family dolls) also do very well, as do composition dolls of well-known celebrities like Judy Garland and Deanna Durbin. Boudoir dolls, especially those by early French makers, can also fetch several hundred dollars or more.